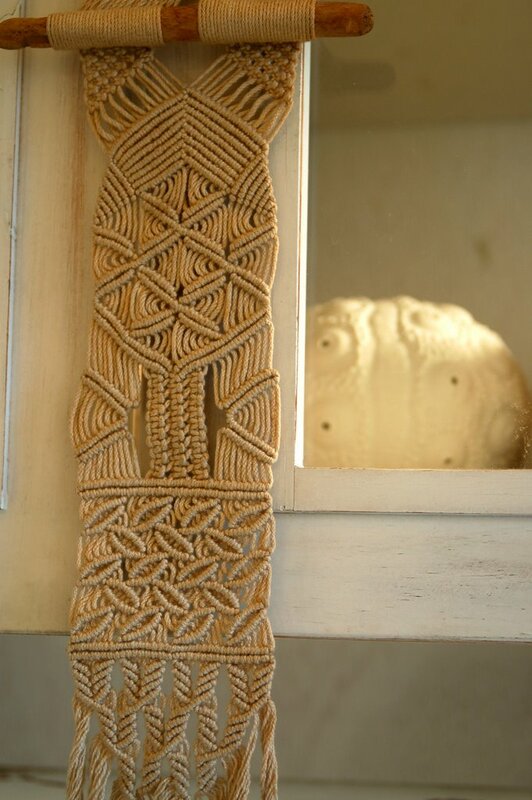 Did you know that before it became popular (and horrendously tacky), macrame was a legitimate art form for fiber artists? This little sampler was made by my Grandma, and I think it must be linen. It's been hanging on our bathroom cabinet for years; I just tied it to the handle one day, and it's never moved. I suppose that acrylic and polyester did to macrame the same thing they did to knitting and crochet: once people started using the lower-quality fibers, macrame developed a reputation for being a tacky hobby instead of earning respect for the lovely knotting and composition it can include. I'm sure that all those plant hangers and belts made by hippies in the 1960's didn't help it gain any respect, either. I wonder if macrame will be rediscovered (like crewel has been) or if it's still too early. Or maybe it will just never catch on in the same way again. I own a few of my Grandma's books on macrame and gave a half-hearted attempt at making a small sampler a few years ago, but someday it might be fun to really experiment with it. I'm still a little unsure that I'm interested enough to really get involved with it, but combined with weaving it could be really interesting. And I promise I won't make any plant hangers. No wall hangings either. That's a beautiful piece! Its small scale and the combination of knots your grandmother used and the bits of branches make it perfect. how bizarre - I was in a charity bookshop a day ago and was looking at a Macrame book wondering just the same thing. I think in the right hands (like your grandmother's) it is a real art form but in the wrong hands it is cheesy and naff but then I suppose the same can be said for all crafts. Wow. I never knew macrame could be that beautiful! Thanks for sharing. 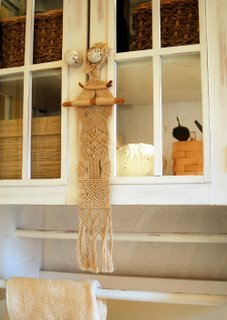 will i be laughed off this forum if i say i always kind of liked the macrame plant hangers?? it's strictly a warm fuzzy feeling of nostalgia though. i've seen some very nicely done macrame purses also. but again, it's all in how and with what. That is a gorgeous piece. I always associated macrame with acrylic and scary colours, but that has changed my mind. I grew up in the land of macrame plant holders and wall art. Oh my. I've barely recovered. I recall receiving a macrame shoulder bag in the mid-70s. It was made in Portugal and this teen tossed it aside: it wasn't "cool". I don't know what's become of it, but it's been so much on my mind lately. Your sampler is quite a reminder. Too bad I didn't realize the beauty of it then! P. S. Luckily my sister saved the embroidered linen tablecloth and napkins also from Portugal. 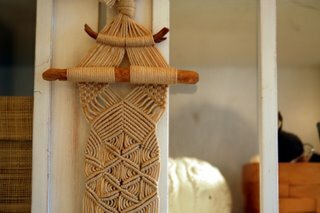 I luv the macrame plant hangers!! I've been all over Home Depot etc., searching for the macrame plant hangers! Way more beautiful than the stupid plasic ones they have! I finally decided, I'm just going to have to learn how to macrame myself. Now the challenge will be to find the books on this lost art! Plus with all the cool fibers they have out now!